The Clan locomotives used cold riveting to assemble the frames and components. The Clan Project Engineering Team had conduct a significant amount of research in this area in order to choose the best fastening method in the 21st century. A key factor influencing our decisions was when we were informed that cold riveting expertise would be hard to find. Therefore a search for an alternative was ncessary. In the years when the frame design was developed, say 1900 to 1950 the principle form of jointing was riveting supplemented by bolting. In more recent times, in many industries and applications, welding and bolting replaced riveting due to advantages in strength, speed and cost. Riveting needs an array of holes to be punched or drilled in the plates to be joined, with a chamfer on the outer edge of the hole so that the rivet head is not over stressed. The rivet itself has to be made with a head at one end and this is fitted into the prepared holes and clinched up tight by forming a second head. The traditional view is of red hot rivets being tossed up to the teams of riveters but there was also a less dramatic cold riveting process. Riveting hot or cold is a skilled operation and has largely been replaced by bolting which can be done by a semi-skilled team. There are 4 main types of fastener to consider. In this process a steel rivet was heated to red heat and placed in the hole. A second head formed tight against the face of the plate. The rivet although hot in everyday terms it would be "warm" in metallurgical terms. Therefore the main purpose of the increased temperature would be to clamp the plates as the rivet cooled and contracted. This contraction would also create a clearance or gap between the rivet and the holes in the plates. The picture above shows the two formed heads and the gap, very exaggerated, between the rivet and the plates. The hot riveted joint may be considered similar to the familiar bolted joint, where the bolt fits into a hole with a significant clearance between the shank and the hole. As the nut is tightened the bolt is stretched and a clamping load applied to the plate, the same as when a hot rivet cools. The clamping force can be controlled by the amount the bolt is stretched measured either as a rotation, so many degrees after just clamping the plates or a torque which has to take into account the variable friction in the thread and between the nut and the plates. The variation in clamping force may be considered to be similar to that caused by the rivet temperature variation. The process here will require heavier loads than for hot riveting but any plastic deformation will remain largely unchanged, the elastic part of the deformation must of course relax. We can imagine on riveting the compressive loads will make the rivet swell at somewhere around its mid-point, this swelling will touch the wall of the drilled hole and the area next to this point will swell so that at the end of the process the rivet will partially or maybe completely fill the hole along its length. At the end of the riveting the compressive loads will relax and the rivet will increase in length, from the elastic properties of the rivet. This might be compensated for in part by the local loading of the plates during the riveting. So it appears that the cold riveting is complimentary to the hot process in that it provides a good positional location but much lower clamping forces. A fitted bolt has a shank which is designed to be a close or interference fit to the holes in the plate, and so can give a tight positional tolerance as well as a clamping force. It maybe thought of as giving the advantages of both types of riveting. The advantages are bought at the expense of designing and making close tolerance bolts, and having to drill and ream each hole to fit the bolt precisely. These are different skill sets to those needed for riveting but are available in the modern workshop. We have decided to go down the fitted bolt route. The frames will initially be assembled using temporary bolts which are slightly undersize into bolt holes which again are slightly undersize. Once the frames and key components have been aligned, the temporary bolts will be replaced by fitted bolts. Each bolt hole will need to be drilled out to the right size and then reamed. Each bolt will then be machined for that bolt hole with an aim to provide a slight interference fit. No washer will be fitted under the bolt head and one plain washer will be used under the fixing nut. We will be using Philidas nuts as lock nuts. A Philidas nut is a locknut with one or more slots cut laterally in the reduced-diameter circular top for less than half the diameter, the metal above the slot(s) being deformed downwards so that over the last one or two turns, the thread for half the diameter is "axially depitched" or displaced from its normal position. 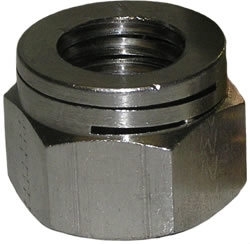 As the nut is threaded on, the displaced sections are elastically forced back axially to their original position, the load increasing the friction between the nut and the fastener, creating the locking action.